Our road system was very different in 1898 than it is today in Tennessee. Roads have to be paid for and so toll booths were set up on different parts of the road and when you came to that person’s toll booth, you paid a small amount to travel on the road. The tolls paid for the upkeep on the road, and the toll keeper’s small pay. Now the last thing anyone wants when they are carrying a body that has been dead for a few days is to have to stop where there might be a witness. You might not remember the good Doctor coming by your toll booth last Saturday night, since doctors often traveled late at night seeing the sick in their homes. However, you would remember that his buggy stank to high Heaven! So Dr. Heimark had to take a route that would not lead him past any toll booths. 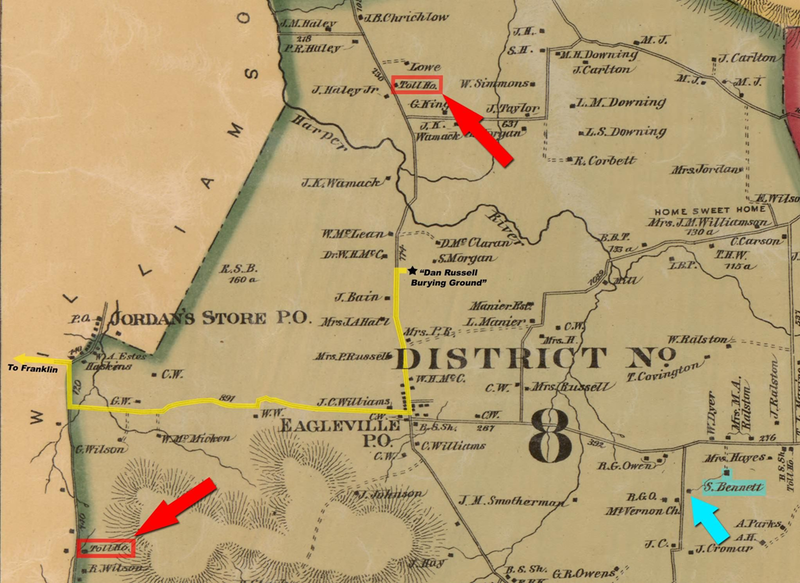 Here we have a map of the 8th District of Rutherford County, where a good number of my family lived in 1898. You will notice the red arrows pointing to the two toll booths. Dr. Heimark stole Mrs. Mary Prewitt’s body from the Dan Russell Burying Ground, marked by a star. She was the first body to be reported missing. The Stephen Bennett home is marked in Blue. Stephen was buried in the family burial ground shown with the blue arrow. Notice how easy it was to avoid the toll booth when stealing Bennett or Prewitt’s bodies? Now that Heimark has been arrested and was on trial, one would assume the families would have some closure and would have been ready to move on with their lives. However, as the O. J. Simpson trial taught us, there are two ways to punish a criminal. The first is in Criminal Court and the second in Civil Court. An article printed an article on 20 Feb 1898 that showed the family of Mrs. Corbett wasn’t going to wait for Heimark to be convicted. 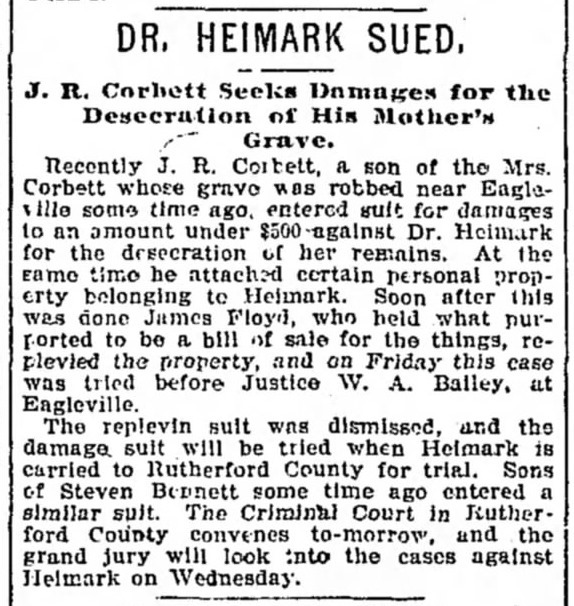 J. R. Corbett, a son of Mrs. Eva (Jane) Corbett entered a suit for damages to an amount under $500 against Dr. Heimark for the desecrations of her remains. He also attached certain personal items that had belonged to Heimark. However a Mr. James Floyd, took possession of those things, since he reportedly had a bill of sale for them. Basically Corbett had a small period of time to collect the items owned by Heimark and they were sold before he could collect. The Judge dismissed this case, and the damage suit for $500 would have to wait until Heimark was tried. Dr. Heimark was Indicted four days later. The trial would run from 24 Feb 1898-04 Mar 1898. Corbett’s case would be ruled in Heimark’s favor. On 21st day of February, 1898, the court added an attachment to the State of TN vs G. W. Batey. G. W. Batey, was a State’s Witness. He was being called to testify against Heimark in the Trial of State of TN vs C. B. Heimark for the charge of Administering poison with the intent to commit murder in the first degree! I guess if you can’t get enough people to die naturally, you just help a few along. It is unclear whom he is being accused of trying to poison. While these seem to be the same charge, in fact, they were not. We have to remember that we are just 30 years removed from the Civil War. Human beings are no longer considered “property.” Removing a dead body, now a Class E Felony in the state of Tennessee, at the time was only a misdemeanor. However, if you also stole clothes, jewelry, other “real” property from the grave at the same time, then you could be charged with theft. Grave Robbing is different from removing the corpse from the grave, in that the intent is to steal property. Bodies were not “property”. The indictment does not tell us which charge went with which case. But its clear that in at least one of the cases, Heimark took far more than just the body. It’s possible that since the Corbett Trial tried to also claim “property” owned by Heimark, that it is her case that got the indictment of Grave Robbing. Indictments against Heimark and McGowan, Rutherford County, TN Criminal Court Minute Book 11, Page 15, Rutherford County,TN Archives, Murfreesboro, TN. State of TN vs C. B. Heimark “Administering Poison to Murder in the First Degree, Rutherford County, TN Criminal Minute Book 11, Page 48. On 01 Mar 1898, the Grand Jury met in the cases of State of TN vs Heimark. Heimark waived his rights to a Jury Trial. I am sure there was no way on earth he wanted a 12 person Jury from Rutherford County, TN deciding his fate. He chose to put his hands in the fate of the Judge. After listening to evidence and both sides arguing their case, Heimark was found guilty in all three charges and fined $150 per charge, and given 6 months in the County Work House to run consecutively, for a total of $450 and 18 months in the Work House. He was to be remanded to the County Jail Keeper and his first sentence would start on 01 Mar 1898. Jodie McGowan was issued a Nolle prosequi on the charge of “Unlawful Internment of a body”. Nolle prosequi is a Latin term that means “be unwilling to prosecute.” He was to pay the Court costs of $25 and was let go. According to the 1900 census, Jodie McGowan was born in April 1880. So at the time of the crimes, he was just a few months shy of his 18th birthday. Dr. Heimark was living with the McGowan as a border, so he was a person Jodie’s parents would have trusted with their children. The only grave robbing Jodie could be definitely proven to have participated in was the one where he lost his shoe. It’s probable that was the only time he was involved. So it’s likely because of his age, and his lack of involvement the state figured it was best to not prosecute, and let him go with a huge slap on the wrist into his parent’s custody. By 1910, the McGowan’s are living in California. Jodie is no longer living at home with his parents. It is to be noted here, that early sources I had read, stated that Jeda or Jodie McGowan was a young black man. In fact, he was white. It’s unclear how that confusion was made, but Blog Post one contains that error, and I wanted to clear that up before we continued. This day came Lillard Thompson, Attorney General who prosecuted for the State and the defendant C. B. Heimark in custody of the Sherriff and the said defendant being arraigned upon the Indictment on this cause for pleas thereto says he is guilty as therein charged and for his trial waives the intervention of a jury and submits his case to the Judgement of the Court. After hearing the evidence, the argument of Counsel, the Court is pleased to find the said defendant C. B. Heimark, guilty of Grave robbery as charged in the Indictment and as he pleads, that for said offense he be sentenced to imprisonment in the Rutherford Jail, for a period of Six (6) months; that he pays a fine of One-hundred and fifty ($150.00) dollars and the costs of their prosecution; that he be taken at the earliest convenience of and by the Sheriff and delivered to the Keeper of the Rutherford County Work House there to be confined at hard labor subject to the rules and regulations of that institution during the period of said six (6) months sentence to imprisonment and at the expiration of said period unless said fine and costa are paid or secured to be paid, he shall remain in custody of said Keeper of said work house subject to the rules and regulations thereof at hard labor until said fine and costs are paid or worked out as prescribed by law, or he otherwise released by due course of law. It is further considered by the Court, that the State of Tennessee, recover of said defendant find and costs aforesaid, for which execution will ensue. The foregoing Sentence will commence from this date. This day came Lillard Thompson, Attorney General who prosecuted for the State and the defendant C. B. Heimark in custody of the Sherriff and the said defendant being arraigned upon the Indictment on this cause for pleas thereto says he is guilty as therein charged and for his trial waives the intervention of a jury and submits his case to the Judgement of the Court. After hearing the evidence, the argument of Counsel, the Court is pleased to find the said defendant C. B. Heimark, guilty of Unlawful removing a dead body, as charged in the Indictment and as he pleads, that for said offense he be sentenced to imprisonment in the Rutherford Jail, for a period of Six (6) months; that he pays a fine of One-hundred and fifty ($150.00) dollars and the costs of their prosecution; that he be taken at the earliest convenience of and by the Sheriff and delivered to the Keeper of the Rutherford County Work House there to be confined at hard labor subject to the rules and regulations of that institution during the period of said six (6) months sentence to imprisonment and at the expiration of said period unless said fine and costs are paid or secured to be paid, he shall remain in custody of said Keeper of said work house subject to the rules and regulations thereof at hard labor until said fine and costs are paid or worked out as prescribed by law, or he otherwise released by due course of law; that his Sentence in this cause commence after the expiration of a Sentence entered on this same day against this same defendant for the same period of time and upon a similar charge. It is therefor considered by the Court that the State of Tennessee recover of said defendant C. B. Heimark the fine and costs aforesaid, for which execution will issue. This day came Lillard Thompson, Attorney General who prosecuted for the State and the defendant C. B. Heimark in custody of the Sherriff and the said defendant being arraigned upon the Indictment on this cause for pleas thereto says he is guilty as therein charged and for his trial waives the intervention of a jury and submits his case to the Judgement of the Court. After hearing the evidence, the argument of Counsel, the Court is pleased to find the said defendant C. B. Heimark, guilty of Removing dead body from place of internment, , as charged in the said Indictment in this cause and as he pleads, that for said offense he be sentenced to imprisonment in the Rutherford Jail, for a period of Six (6) months; that he pays a fine of One-hundred and fifty ($150.00) dollars and the costs of their prosecution; that he be taken at the earliest convenience of and by the Sheriff and delivered to the Keeper of the Rutherford County Work House there to be confined at hard labor subject to the rules and regulations of that institution during the period of said six (6) months sentence to imprisonment and at the expiration of said period unless said fine and costs are paid or secured to be paid, he shall remain in custody of said Keeper of said work house subject to the rules and regulations thereof at hard labor until said fine and costs are paid or worked out as prescribed by law, or he otherwise released by due course of law; that his Sentence in this cause commence after the expiration of two other Sentences entered on this same day against this same defendant for the same period of time and upon a similar charges as set out on pages 34 and 35 this book. It is therefore considered by the Court that the State of Tennessee recover of said defendant the fine and costs aforesaid, for which execution will issue. 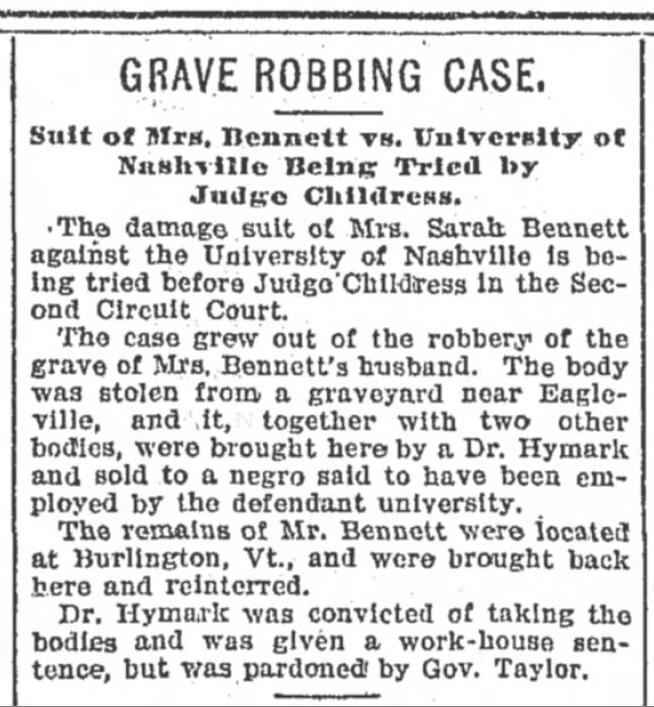 On March 4, 1898, the Grand Jury met in the case of State of Tennessee vs C. B. Heimark “Administering Poison to murder in the first degree”. Again, Nolle prosequi is a Latin term that means “be unwilling to prosecute.” For some reason the Prosecutor, Lillard Thompson, Attorney General has come before the court and has filled a prosequi on the condition that the Defendant, Heimark pay all the court costs. Basically, for some reason the State decided NOT to prosecute Heimark on Murder charges. It’s possible that they just did not have enough evidence against him. It’s unclear who Heimark was being accused of poisoning. One thing we can be sure of is that it was not Stephen Bennett, who was attended at the time of his death by Dr. J. R. Moon according to his probate papers. Dr. John Robert Moon had also attended the University of Nashville Department of Medicine, having graduated in March 1878. While he and Heimark graduated from the same school, there is no indication that they were in any way connected and if he was called to testify, he did so without issue in the Heimark case, because he is not mentioned in any of the Criminal Minutes of Rutherford County. We can assume he merely attended his elderly patient, Stephen Bennett until his death and was in no way involved in anything else going on in this case. It is important to note here that under Title 64, Chapter 4 of the Tennessee Burial laws, section 104, it is not illegal for Medical Schools to receive bodies to use as cadavers. However, the law does make it illegal to remove a body from the grave. Bodies donated to Medical School must be used for the promotion of science, they must surrender the body to the family at any time, and once they are done with the body, they must summon a funeral director to take over the body at the cost of the institution. We may not have much to thank Dr. Heimark for, but at least our cemetery laws in TN now protect families from similar experiences! Heimark paid the Court costs of $25 and the charges were not prosecuted. Administering Poison to murder in the first degree. This day came Lillard Thompson, Attorney General, who prosecutes for the State and the defendant C. B. Heimark, in custody of the Sherriff, and with consent of the Court the Attorney General, enters a small prosequi in the cause to take effect on condition upon the defendant paying a full bill of costs. Thereupon came N. J. Owen, for the said defendant and paid to the clerk the sum of Twenty dollars. 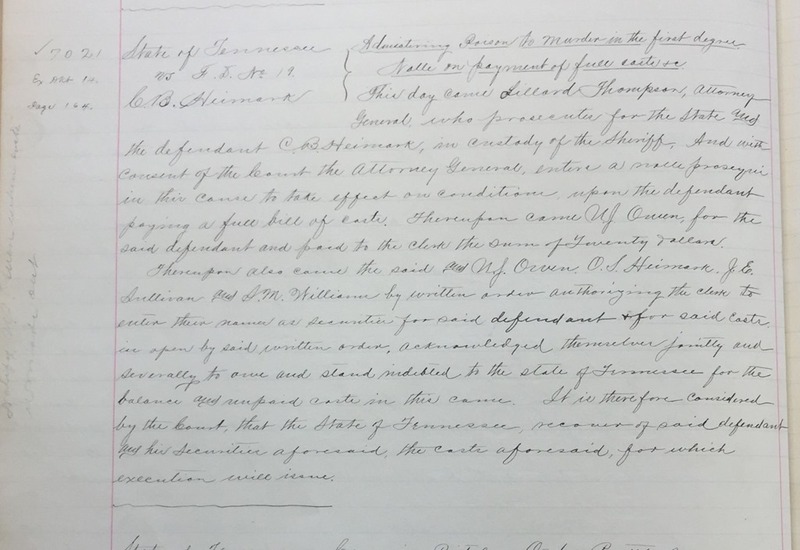 Thompson also caused the sad N. J. Owen, O. S. Heimark, J. E. Sullivan and S. M . Williams by written order authorizing the clerk to enter their names as securities for said defendant and for said costs in open by said written order, acknowledged themselves jointly and severely to owe and stand indebted to the state of Tennessee for the balance and unpaid costs in this cause. It is therefore considered by the Court that the State of Tennessee recover of said defendant and his securities aforesaid, the costs aforesaid for which execution will issue. 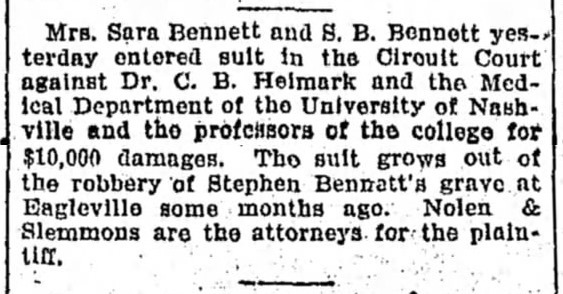 On the 26 of Apr 1898, Sara Bennett and her son, S. B. Bennett filed suit against Dr. C. B. Heimark and the Medical Department of the University of Nashville and the professors of the college for $10,000 damages. We know that Heimark had graduated from the University of Nashville and had been an intern for a while at the Asylum in Nashville (later known as Central State). We also know that the University had taken possession of the bodies of Stephen Bennett and Eva Jane Corbett and in a panic the professors of the Medical Department had sent the bodies to Burlington, VT. So I can certainly understand a Civil Suit being filed against the University. If nothing else it would stop them from purchasing illegal bodies for cadavers and most likely this case was meant to do just that. In todays’ money, that’s about $280,000, so while it may seem like a lot of money, we have to consider the millions of dollars that would be awarded the family today. The Bennett case, like the Corbett case was ruled in Heimark’s favor and neither family collected any money for damages. It is assumed they had to pay to have their loved ones reburied at their own expense. The trial of Sarah Bennett vs Heimark and the University of Nashville is being tried before Judge Childress. But here we learn a very new and very interesting piece of information! Heimark was convicted and was given a work-house sentence. Then he was pardoned by Governor Taylor! While a Pardon does mean you have been forgiven of your crime and you do not have to serve the time sentenced, you do still have a conviction against you. So Heimark’s three Indictments would still stand, but he would not have to serve any more time. At this time, I am waiting on copies of his Petition for a Pardon from the State Archives. It will be posted in a later blog post, so I am not sure how much time he actually served. Governor Robert Love Taylor served as Governor of Tennessee from 1897-1899. According to Wikipedia, “he was assailed for issuing too many pardons, and demanded the state build a reformatory for juveniles. When he didn’t get it, he issued a pardon to virtually every juvenile who sought one.” C. B. Heimark was around 25 years old when he committed his crimes. It’s possible that his young age and the Governor’s anger over the state not building a reformatory for juveniles is the reason he received his pardon. By 1910, Charles Heimark, his wife, Dulaak, and three children, Beatrice, age 9, Alexander, age 8, Oliver, age 2 are living in Minnesota and he is practicing medicine. Let’s hope he took this second chance at life and lived it to it’s fullest. Sarah Catherine Brown Bennett died in Rutherford County, TN in August 1904. She is buried in the family cemetery with her husband. Their stones have since been replaced with a newer stone containing their names and that of Stephen’s parents Drury and Elizabeth Manier Bennett. Today the cemetery is a peaceful family burial ground. The 8th District of Rutherford County only remembers the story because it has been retold in numerous newspaper articles. The primary participants have long been forgotten.